Just over a year ago I was having lunch with my mum at Carluccio’s discussing magazines. She’s the best person I know to talk about it because she’s so magazine obsessed. I remember as a child we used to have stacks and piles of magazines in our living room. I was telling her that I was thinking about packaging my blog’s content into a monthly newsletter but I was also considering a magazine format. We both were tired of reading about the same thing – trends and young girls, which we can’t relate to. Plus each major publication is at least 30% of the content covered with ads – the same ones. Yes, I get it. It’s all about exposure but to me, it’s doing nothing. I’m not going to buy anything based on picture-perfect-photoshopped illusion. If you want to do a product advert, tell me the story behind it. Anyway, after some digging I was warming more and more to the idea of a magazine and once I made my mind up, I was all in. I contacted four other bloggers who would be willing to help me with the first issue and three weeks later we released our first issue on issuu.com. Since last September we consistently released our issues on monthly basis and attracted just shy of 1 million views. Looking back, it wasn’t easy. Over time I found out why it was actually so hard. One of my biggest struggles were, and still are sometimes, sticking to the schedule, getting people onboard and once they are onboard getting them to keep their word. I had few occasions where four hours prior the publishing time, I still found myself with several empty pages. Even with all the backups and reserves this still can happen. Why? I’m still trying to figure it all out. I can only control the work of our editors, contributors and my own work, but if there is another source, which we have to rely on, that’s probably when things can go wrong. But with each disaster there is a lesson to be learned. Over the past year I’ve been defining my role of an editor for sure, learning to orchestrate the content, promote the brands and women we feature and much more. But the journey that was once so foggy is now becoming clearer. I got the opportunity to go into print, which, I must admit, wasn’t in my plan. However, stepping into the unknown is something I’ve learned to embrace. My approach was that I would probably want to go into print sooner or later so why not do it sooner, make mistakes (because going into print is a completely different ball game) and learn from them while the publication is still quite small. Plus, wherever I went and talked to women outside of the online world about the magazine, I realised that they would never come across it. Only after I showed them my demo, they said that they love it. And so here it is. 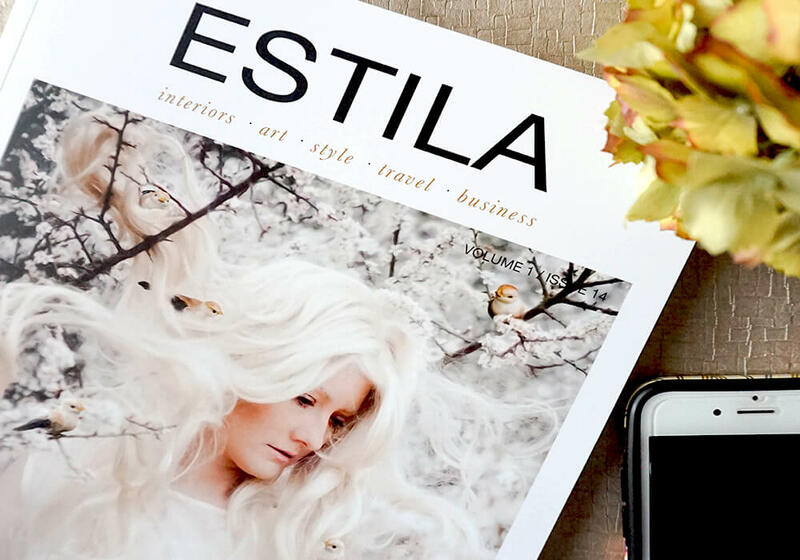 Our first print Estila magazine issue called “The Style Tales”. I can’t quite believe how far we’ve come over the last year and a bit. Last summer I wrote down a list of designers, who would be ideal candidates of the core message of the magazine – to embrace your style, and who are ambassadors and creators of their own labels and lifestyle brands. One of them on the list was Matthew Williamson. Thanks to our interiors editor, Anouska, we managed to get an exclusive interview. Other names on the list included Grace Bonney from Design*Sponge and Kim Winser OBE, who I both interviewed for this issue. I’m so pleased with the result. All of these interviews are full of wisdom and tips, which you can take away and apply in your own way. Plus, there is so much other inspiration inside too. I’m starting to take pre-orders for the issue. It should be ready for dispatch first week in November and will be available in shops from 24th November. I have a small surprise for the first 200 orders as well so click here asap for your chance to get it. P.S. The cover is by Nicola Taylor Photographer – she creates stunning photography art and has an amazing story to tell inside too! !